When it comes to two different fossil fuels – oil and natural gas – is it accurate for us here in the United States to think that each fuel is equally impacted, at least in regards to market price and market stability, when ever-greater reserves of each are tapped by our country’s oil and gas exploration companies? 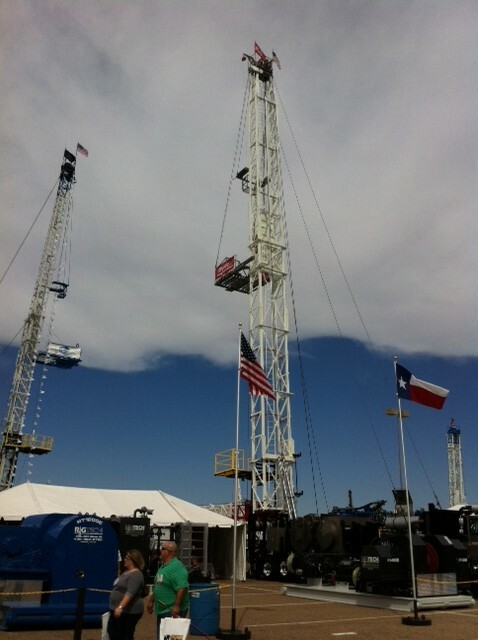 A derrick and other exhibits on display at the International Oil Show, Oct. 16, in Odessa, Texas. That might seem like an odd question to ask, but I think it is worth exploring. I do believe that the assumption is that the market value of each fuel is equally affected by supply-and-demand fluctuations. In other words, the assumption likely is that when supply of oil or natural gas is increased due to increased exploration/production, that the market value of the product then dips. That would be the classic outcome for any commodity: the more that supply goes up, the less demand there is for the product, and therefore the lower price that the product can expect to command on the open market. My question is not whether or not this dynamic applies to commodities. It is whether natural gas and oil, considered separately, are equally impacted here in the United States when their respective supplies go up – or down, for that matter. And I will contend that they are not equally impacted, and that that fact underscores a critical, and heretofore neglected, dynamic, where domestic and international oil and gas economics are concerned. We are all well aware that natural gas prices have plummeted since the hydraulic fracturing boom got underway. Exploration companies tapped vast new reserves, and – as the law of supply and demand would dictate – the demand for natural gas lessened and the price fell. Dramatically. To roughly half of where it had previously stood. And of course natural gas prices still remain in the tank. That’s the reason why so many oil and gas companies have stampeded over to the “liquids” plays – mainly oil. Oil prices have not suffered the way that natural gas prices have. Oil prices, in fact, have remained strong. This fact has been capitalized on, of course, but I have not noticed market observers commenting on the apparent discrepancy between the two fossil fuels. Shouldn’t oil prices have experienced a dampening effect as well? It seems to be taken for granted that one commodity – natural gas – could be adversely affected by the tapping of huge new supplies. But the fact that oil has not been similarly affected seems to be a phenomenon that the market has hardly bothered to examine. I think an explanation does exist, and that it tells us much about what we can expect in coming years in this industry. To understand the current dynamic, we need to see how natural gas differs from oil, in the way that each responds to increases or decreases in supply. In the United States, virtually all of our natural gas is produced here within our natural borders. There is relatively little importation of natural gas. By contrast, we import most of our oil: more than 60 percent of it. So think about how increases in each commodity impact the supply of that commodity. When our production of natural gas goes up markedly, we have increased our national (that is, within our borders) supply of oil. That supply was the supply that our consumers of natural gas were tapping, are tapping. So an increase in natural gas is a real increase in supply, where our national demand for natural gas is concerned. And while it is true that any increase in oil represents an increase in the worldwide supply of oil, the way that an increase affects us in the United States is somewhat different. When U.S. oil supplies go up, U.S. oil companies can and do offer more oil to U.S. consumers. But the U.S. suppliers are not pouring oil into a market that was limited in supply of oil. Obviously, more than 60 percent of our oil was coming from outside our borders. So there was already an “adequate” supply, if we are to think of imported oil as representing something adequate. Still, the point is that sufficient supply already existed, where U.S. consumers are concerned. So what does an up-spike in U.S. oil production mean for the U.S. oil market? It means an increase in market share. Rather than directly impacting market supply (supply was already being, well, supplied by oil exporting nations), the U.S. producers take a larger piece of the pie here domestically. So an increase in U.S.-produced oil does not shake up the supply-and-demand balance the same way that an increased in U.S.-produced natural gas shakes up the supply-and-demand balance. For those consumers of natural gas, the supply really has gone up markedly. Contrarily, for U.S. consumers of oil, the availability of oil – that is to say, the supply of oil – was not, is not, so dramatically altered. We were already getting most of our oil from outside suppliers. When the new U.S. oil enters the market and we purchase that oil, we merely make an adjustment – we purchase somewhat more from our local suppliers, and somewhat less from our overseas suppliers. But that, of course, is good for the U.S. trade deficit. And the overarching point here is that oil is not nearly so vulnerable to price declines, and least not here within the U.S., as natural gas is. Nor should it be severely impacted even if domestic production of oil goes up at an even-higher rate than it is accomplishing now. We could more than double our national output of oil and all we would be doing is cutting out the foreign supply. Domestic producers would be increasing their share of market. That state of affairs should remain steady for us, happily, as we continue to make greater inroads against that unfavorable trade deficit in oil – and inch toward an encouraging prospect of national energy independence.